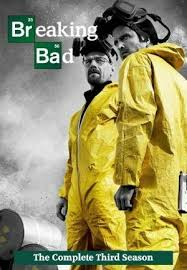 Breaking Bad - Season 3: As the city of Albuquerque deals with the aftermath of the mid-air collision, Walter confesses his meth cooking to Skyler, putting tension in their marriage. Despite ever-increasing tension between Walt and Skyler, he pulls out all the stops in an effort to reconcile with the family. Elsewhere, Saul is instrumental in getting Jesse involved in a most unusual investment opportunity.